A clear plastic box the size of a sofa sits in an underground factory in the suburbs of Toulouse in southern France. Inside it, a nozzle fixed to a robot arm carefully drips translucent gloop onto bits of circuitry. This is to help get rid of excess heat when the electronics start to operate. The slab that is created is then loaded onto a trolley and taken away as the next piece of electronics arrives for the same treatment. This is what the mass production of satellites looks like. Making them in quantity is a necessity for OneWeb. The company was founded in 2012, and it has yet to launch a single satellite. Yet it plans to have 900 in orbit by 2027. That seems a tall order. Intelsat, the firm which currently operates more communications satellites than any other, has been around for 54 years and has launched just 59. OneWeb, which is part-owned by Airbus, a European aerospace giant, and SoftBank, a Japanese tech investor, needs such a large quantity of satellites because it wants to provide cheap and easy internet connectivity everywhere in the world. Bringing access to the internet to places where it is scarce or non-existent could be a huge business. Around 470m households and 3.5bn people lack such access, reckons Northern Sky Research, a consultancy. OneWeb is one of a handful of firms that want to do so. They think the best way to widen connectivity is to break with the model of using big satellites in distant orbits and instead deploy lots of small ones that sit closer to the ground. The rate at which an object orbits depends on how far away it is. At a distance of 380,000km, the Moon takes a month to travel around the Earth. The International Space Station, around 400km up, buzzes round in an hour and a half. In between, at an altitude of about 36,000km, there is a sweet spot where satellites make an orbit once a day. A satellite in this orbit is thus “geostationary”—it seems to sit still over a specific spot. Almost all today’s satellite communications traffic, both data and broadcasts, goes through such satellites. The advantage of a geostationary orbit is that the antennae that send data to the satellite and those that receive data coming down from it do not need to move. The disadvantage is that sending a signal that far requires a hefty antenna and a lot of power. And even at the speed of light, the trip to geostationary orbit and back adds a half-second delay to signals. That does not matter for broadcasts, but it does a little for voice, where the delay can prove tiresome, and a lot for some sorts of data. Many online services work poorly or not at all over such a connection. And it always requires a dish that looks up at the sky. Ships, planes and remote businesses rely for internet connections on signals sent from geostationary orbit, but this method is too pricey for widespread adoption. 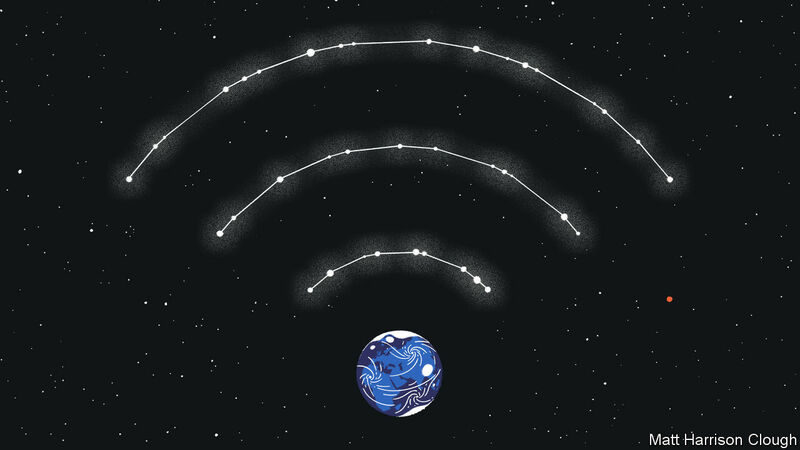 Beaming the internet via satellites orbiting closer to the planet has been tried before. The idea was popular at the height of the tech boom of the late 1990s. Three companies—Teledesic, Iridium and Globalstar—poured tens of billions of dollars into the low-Earth orbit (leo) satellite internet. It culminated in the collapse of Teledesic. Although the technology of the time worked, it was very costly and so the services on offer had to be hugely expensive, too. Iridium survived, but as a niche provider of satellite telephony, not a purveyor of cheap and fast internet access. OneWeb is among several firms that are trying leo satellites again. SpaceX, a rocket company founded by Elon Musk, a tech entrepreneur, is guarded about its proposed system, Starlink, but on November 15th American regulators approved an application for 7,518 satellites at an altitude of 340km (bringing the total for which the firm has approval to nearly 12,000). Telesat, a Canadian firm, has plans for a 512-satellite constellation. LeoSat, a startup with Japanese and Latin American backers, aims to build a 108-satellite network aimed at providing super-fast connections to businesses. Iridium, still in the game, will launch the final ten satellites in its new constellation of 66 by the end of the year. Not to be outdone, a Chinese state-owned firm recently announced the construction of a 300-satellite constellation. 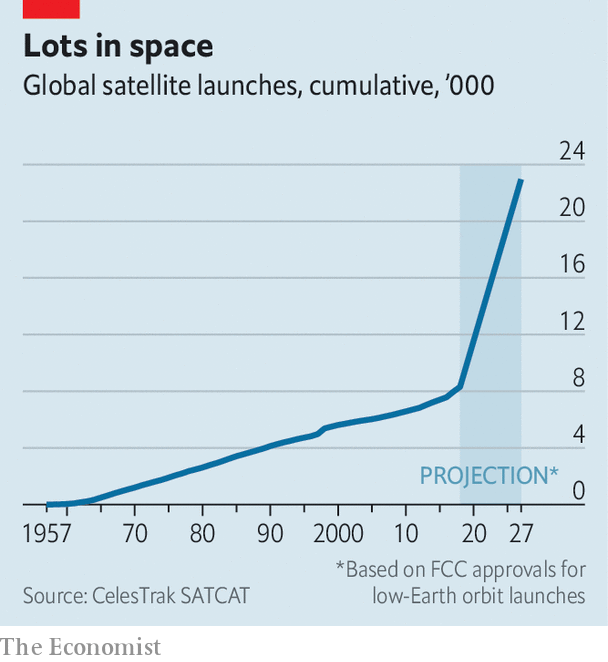 In ten years’ time, if all goes to plan, these new firms will have put more satellites into orbit by themselves than the total launched to date (see chart). These companies want to avoid the technical issues of geostationary satellites by putting theirs into a low orbit, where the data will take only a few milliseconds to travel to space and back. And because signals need not be sent so far the satellites can be smaller and cheaper. OneWeb claims they might weigh 150kg and cost a few hundred thousand dollars, compared with a tonne or more, and tens or even hundreds of millions of dollars, for the geostationary sort. At 1,200km up, where OneWeb intends its first satellites to operate, they do not sit still in the sky. A satellite overhead will sink below the horizon seven minutes later. That has two consequences. First, to ensure that a satellite is always available to any user, a great many are required. Second, to talk to such a satellite you need an antenna that can track it across the sky. One way to understand this is as a cellular-phone network turned inside out. 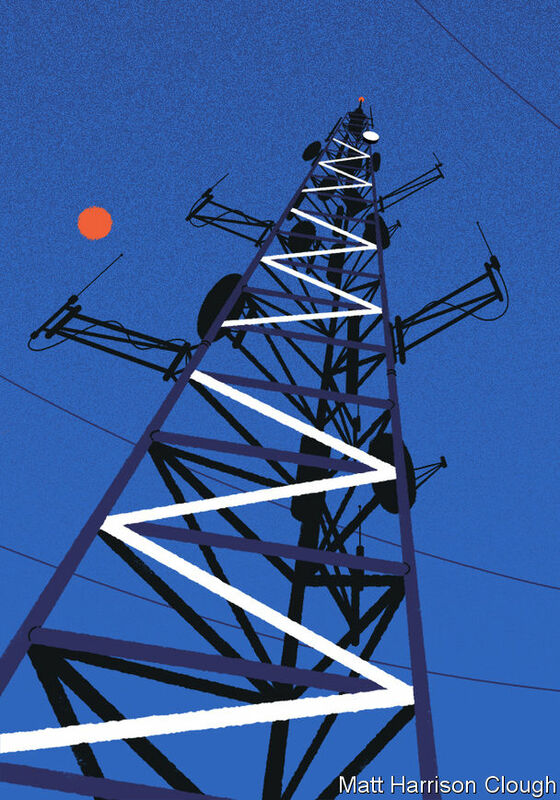 On Earth, cell-phone towers are fixed; a user’s phone talks to the closest or least busy one, which may change as the user moves or traffic alters. In OneWeb’s system each satellite is a moving cell tower, circling the Earth from pole to pole in one of 18 orbital planes that look like lines of longitude (see diagram). The 900 cells, each one covering an area of a bit more than 1m kilometres, skim across the Earth at 26,000km an hour. Clever software hands transmission from one satellite to the next as they move into and out of range. There are three ways to connect to such a network. One is to place an antenna on a terrestrial cell tower, which can use the satellites to get data to and from a mobile-phone network, in place of the fibre optic, microwave or cable links that are normally used. The second is for homes and businesses to have their own ground terminals, smaller and cheaper antenna that can talk to the satellite. The third is for vehicles to have ground terminals. This might be important for driverless cars, which will need to transmit and receive large volumes of data over an area which may be broader than that covered by appropriate terrestrial cellular networks. In all cases data will make their way to the wider internet through large ground-based dishes, called gateways. An email sent from a house connected to one of the new satellite network, for example, would travel up to a passing satellite, down to a gateway then onward to its destination. The firms involved today hope to overcome the obstacles confronting the previous generation of leo satellite firms because building and launching hundreds of satellites is now much cheaper. The cost of launch in particular has tumbled in the past decade with the arrival of better rockets and more competition. OneWeb has a contract, reportedly valued at over €1bn ($1.1bn), for 21 launches with Arianespace, a European consortium. Russian-built Soyuz craft will also take 34 to 36 satellites up at a time from either French Guiana or Kazakhstan. OneWeb may later use Blue Origin, a rocket firm owned by Amazon’s founder, Jeff Bezos; it also has a contract for launching single satellites to replace ones that break down with Virgin Orbit. Virgin Group, like Airbus and SoftBank, is an investor in the company. SpaceX intends to launch its satellites on its own rockets. OneWeb and SpaceX thus not only have to make new satellites, they have to build a system for building satellites. OneWeb has been doing so in Toulouse for the past two years. Its first satellite was completed in April and ten more will be ready in time for the company’s first launch, some time before February 2019. To step up manufacture, OneWeb is building two copies of its production line in a new factory in Florida. It hopes to have the first satellite from this facility ready before March 2019 and to raise output to ten a week not long after. The factory floor in Toulouse has separate workstations for propulsion systems, communications payload, solar panels and so on. Satellites in the making move on robot carts from one station to the next. Cameras track the components and look out for errors—misalignments and the like. The finished cube is about the size of a beach ball bedecked with antennae and solar panels. After testing, it is shipped out. The system has had teething problems. The first launch will be more than a year behind schedule. But Greg Wyler, OneWeb’s boss, says he still hopes to offer connectivity in places in higher northern latitudes, such as Alaska and Britain, by the end of 2019. Putting satellites in place is only part of the problem. How useful they will prove to be depends on designing and building antennae to get data to homes or vehicles that are not close to terrestrial cell towers. “The elephant in the room…has always been the ground terminal,” says Nathan Kundtz, the former boss of Kymeta, which makes antennae. Mr Kundtz says that tracking satellites across the sky mechanically is untenable if the antennae are to be affordable and widely used. His firm does tracking electronically. No moving parts, he says. Teledesic failed in part because no such ground terminal existed in the late 1990s. Fortunately, the necessary electronics have shrunk in size and cost. Firms such as Kymeta, along with at least two other companies, Phasor and Isotropic Systems, are producing flat, electronically “steerable” antennae with no moving parts that can send and receive signals from leosatellites. Kymeta’s antenna is the least orthodox. It relies upon the same kind of lcd display found in laptops and flat-screen televisions. Instead of using the 30,000 pixels in its screen to display images, it uses them to filter and interpret the satellite signal by allowing it to pass through at some pixels and blocking it at others. Different patterns of pixels act like a lens, focusing the signal onto a receiver beneath them; the pattern shifts up to 240 times a second, changing the shape of the “lens” and thus keeping track of the satellites overhead. Phasor’s system works similarly, but uses an electronically controlled array of microchips to perform the same task. Isotropic Systems, which has said that it is developing an antenna that will be able to receive signal from OneWeb’s satellites, uses an optical system more like Kymeta’s. Kymeta and Phasor have both said that they do not want to sell antennae directly to consumers, but will focus on businesses, cellular networks, maritime and aviation customers instead. Isotropic Systems has announced that it will use its technology to produce a “consumer broadband terminal” in time for OneWeb’s launch. Once available, consumers are most likely to get the new pizza-size antennae through their internet service providers. But if it is too expensive for people to receive signals on the ground—most of the world’s unconnected are poor—those ventures selling direct to consumers will struggle. Mr Wyler says his firm needs antennae that cost $200 at most for the consumer business to thrive. Telesat, the next biggest firm in terms of constellation size, is taking a different approach. It does not plan to offer services to consumers directly, but instead is focusing on filling in gaps for cellular networks, as well as businesses, ships and planes. Specialised telecoms companies would buy bandwidth and resell it. In contrast to Messrs Wyler and Musk, and their aspirations for global coverage, Telesat has divided the surface of the planet into thousands of polygons, and modelled exactly in which ones it makes financial sense to offer strong connectivity. This means its constellation needs fewer expensive gateways. Mr Wyler, in contrast, is known as something of a connectivity evangelist. His first satellite internet firm, o3b (Other 3 Billion), placed large satellites in a higher orbit, providing a connection only slightly slower than a leosatellite. Now owned by ses, a larger satellite company, o3b specialises in providing connectivity to islands that are otherwise cut off. OneWeb’s goal of connecting consumers is largely in the hands of SoftBank, its main investor, which owns the exclusive rights to sell the new bandwidth. Even if the new satellites bring the internet to people and parts of the planet that have been ill-served up until now, putting ever more objects in space brings another set of difficulties. Satellites in densely packed constellations may crash into each other or other spacecraft. “If there are thousands [of satellites] then they’ll have much higher probability of colliding,” says Mr Dyer. “If there is a collision in these orbits it will be a monumental disaster. At 1,000km, if there’s an incident it will be up there for hundreds of years.” Geostationary satellites, because they do not move relative to each other, are unlikely to collide. Managing constellations is particularly difficult, says Mr Wyler, because each satellite has only a tiny amount of power to work with (equipping small ones with bigger thrusters would be hugely expensive). So even if a crash were imminent, there would be little that could be done about it other than watch. “What are you gonna do? Nothing. Get popcorn. There’s nothing to do,” says Mr Wyler. OneWeb has designed its constellation so that faulty satellites fall out of orbit immediately to avoid this risk. The new constellations will also raise tricky questions of national jurisdiction. Countries generally have control of the routers which connect them to the wider terrestrial internet. Satellites threaten that control. The national regulators that OneWeb has talked to are uneasy, says Mr Wyler, because it would create a route to the internet that countries could not monitor. OneWeb’s intention is to build 39 “gateways” on the ground around the world that will beam up and receive traffic from its satellites. The first is under construction in Svalbard, a remote Norwegian island chain. These access points, and those planned by other firms, present another difficulty. Some countries are willing to share gateways with other countries. Others want their own because they are concerned that third parties will be able to monitor internet traffic, potentially using it to hack data flows of national importance. Questions remain about whether the businesses involved can do all they promise cheaply enough. But if these companies succeed, their impact will go beyond helping to bring 3.5bn people online. Mr Musk has hazy plans to use Starlink as the foundation for a deep-space network that will keep spacecraft connected en route to Mars and the Moon. With a network of satellites encircling the planet, humans will soon never be offline. High-quality internet connections will become more widespread than basic sanitation and running water. The leo broadband firms are trying to reinvent the satellite industry. But the infrastructure they are planning will provide a platform for other industries to reinvent themselves, too. Correction (December 11th, 2018): This piece originally stated that Intelsat has launched 59 satellites in its 54-year history. That is the number of active satellites the firm has in orbit. The firm has successfully launched 94. Sorry. Thanks to SC for sharing this story with us @ Z5G!